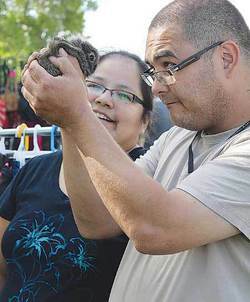 Eye to eye with Brer Rabbit at the Calmar Fair. Calmar’s annual Fair and Mega Market started on Friday evening August 16th with the Calmar Fair Bench show being set up for judging on Saturday and a movie night held on the ball diamonds. On Saturday, August 17th, under sunny skies, the day started with a Pancake Breakfast at the Calmar Curling Rink from 8am to 10am. Vendors from all over began to set up their booths for the Mega Market, which went from one end of Main Street to the other and down a few side streets. Items from tattoos to bunny rabbits and everything in between where available in the largest “garage” sale ever! At 11 AM the Parade began with a color guard and MP Brian Calkins leading the way. The parade started near the Calmar Elementary School and wound down Main Street, closing off Highway 39 for a period of time and ending down 47th Street. Floats ranged from Glen Park’s announcing their 80th Year Anniversary to service organizations and commercial interests. Characters from Toy Story joined with antique cars, go-karts, equestrian horses, and colorful bikers in making the parade a very enjoyable experience for spectators and participants alike. This year candy was prohibited from being thrown from the various floats due to the safety risks involved with the practice. This resulted in most floats having people walking alongside the float and going into the crowd to distribute candy directly to the young fans enjoying the parade. This was not only safer, but brought many smiles to the young audience. When the parade wound down, observers were then free to visit the hundreds of vendors that lined the street until 4pm. While parents were taking advantage of the many opportunities to find that special bargain, their children had an opportunity to enjoy the Kids Carnival centered at the Arena Parking Lot or the Petting Zoo hosted by Thistle Hill Farm on the grass by the Curling Rink Parking lot. Meanwhile, a Slo-Pitch tournament was held at the ball diamonds where one could find an active beer garden both hosted by the Calmar & District Minor Hockey Association. The very successful day came to an end with a fireworks display at 10:30pm.